Donald Trump has proposed a 20 percent tariff to pay for his proposed barrier on the border with Mexico. During the campaign, he often proposed raising tariffs on China up to 40 percent and renegotiating or leaving trade deals. Among his first executive orders was one to call for “renegotiating” NAFTA and leaving the Trans Pacific Partnership. Trump’s argument for doing so rests on the case that America imports a lot of goods and thus has a high trade deficit and that he and some of the economists he has surrounded himself with, such as Peter Navarro, believe that America’s trade deficit is causing manufacturing jobs to be lost to countries with low wages, like China. Trump is right that the U.S. has a high trade deficit, though he often espouses false and exaggerated numbers. In one debate he said the U.S. had an $800 billion trade deficit. In fact, the U.S. had a $484 billion trade deficit (deficit in current account balance) in 2015. Canada and Mexico were also among the top seven. However, the United States also has the largest economy in the world. America’s trade deficit is nearly the same as that of Canada and Mexico as a percentage of GDP. Indeed, according to the IMF, the three countries rank consecutively. 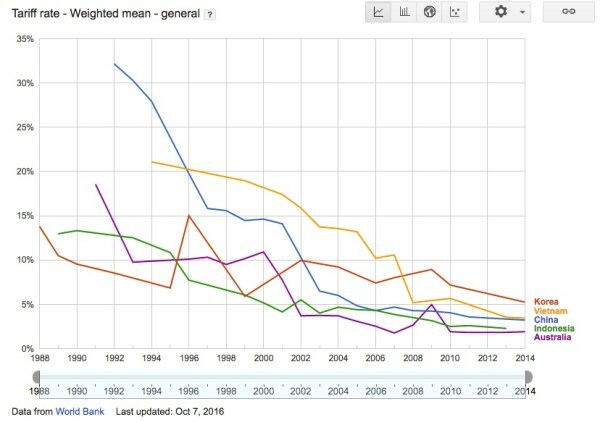 Tariffs around the world have been falling for years as countries embrace free trade. While Mexico’s average tariffs remains higher and more volatile than Canada’s or America’s, it has fallen since 1990. 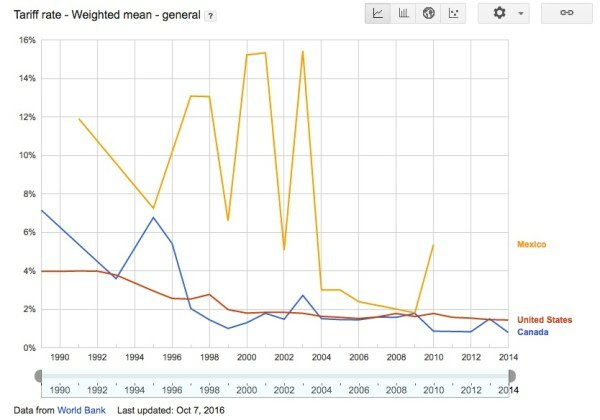 Tariffs in important Asian countries have fallen “bigly.” China’s average tariff fell from over 30% in 1992 to less than 5% by 2014. When China joined the WTO in 2001, its tariff fell from close to 15% to 10% the next year. 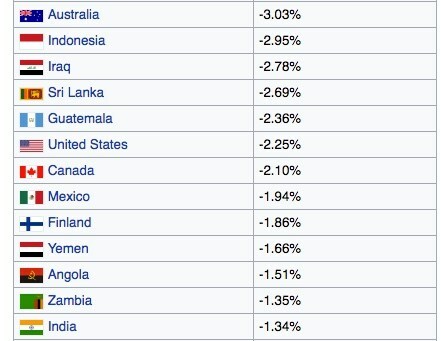 Along with a decrease in tariffs, major Asian countries have also seen increases in imports. The number of manufacturing jobs has been decreasing in the United States since the 1960’s. 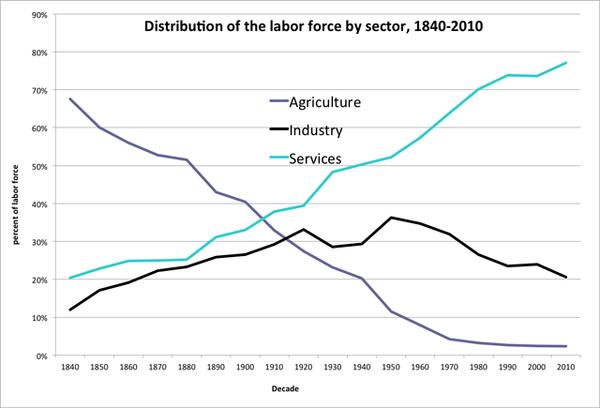 And the number of jobs in agriculture has continued to decline since the 1800’s. The decline of manufacturing jobs is roughly in line with the decline of manufacturing as a percentage of economic output. 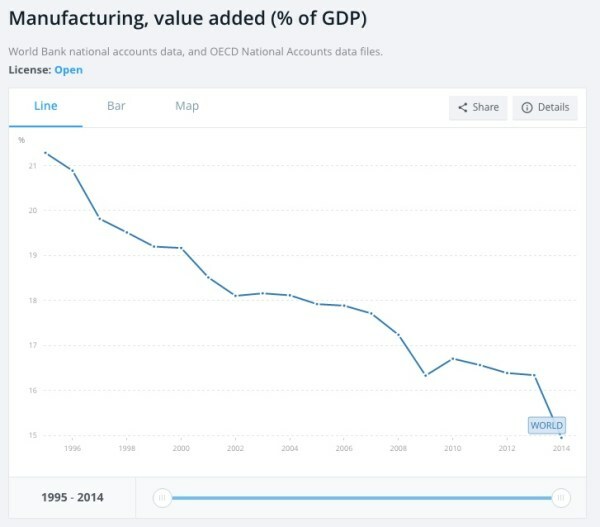 The amount manufacturing is contributing the whole world’s economy is decreasing. 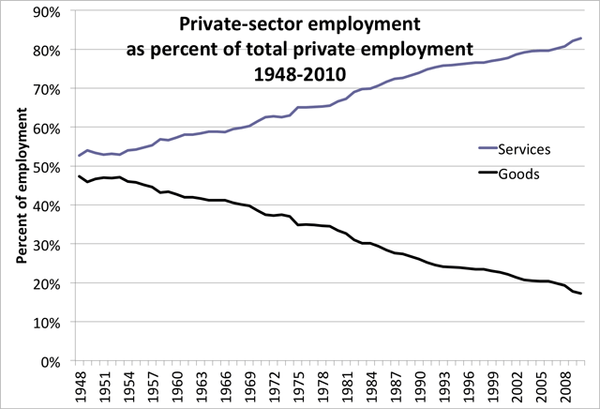 But at the same time, commerce and employment in services is increasing. 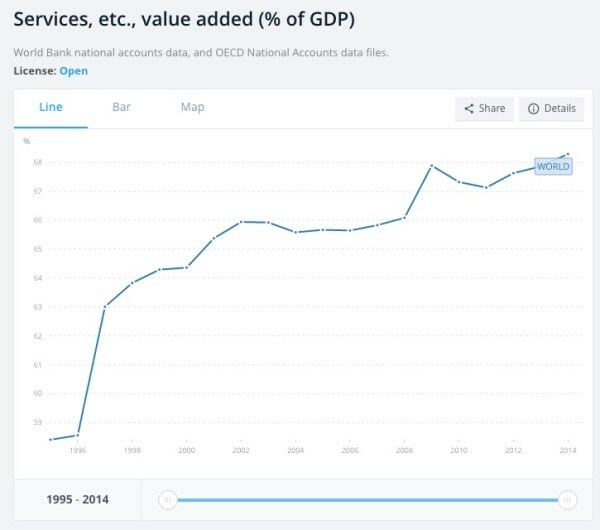 Indeed, the trend towards services is also happening across the world economy. 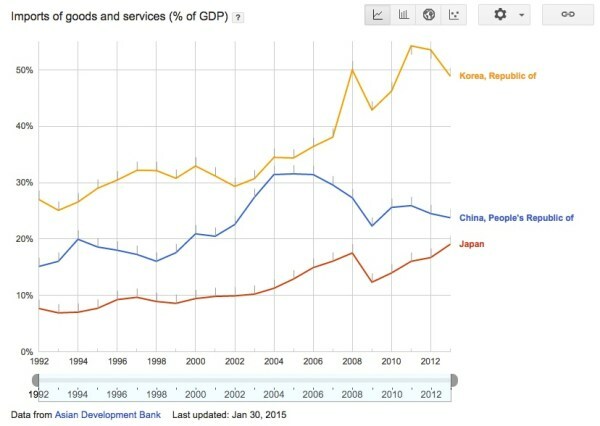 The amount services contribute to the economy is also increasing in China, Korea, and Japan. 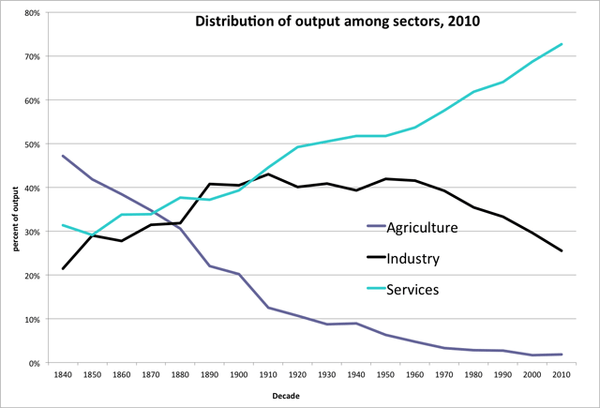 The amount the industrial sector contributes to Asian economies hasn’t increased markedly. 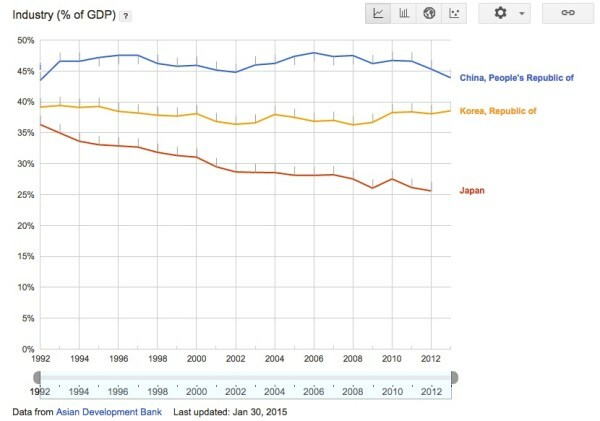 It has fallen in Japan almost continuously since 1992 and nearly remained stable in China and Korea. It has fallen in China since 2006. 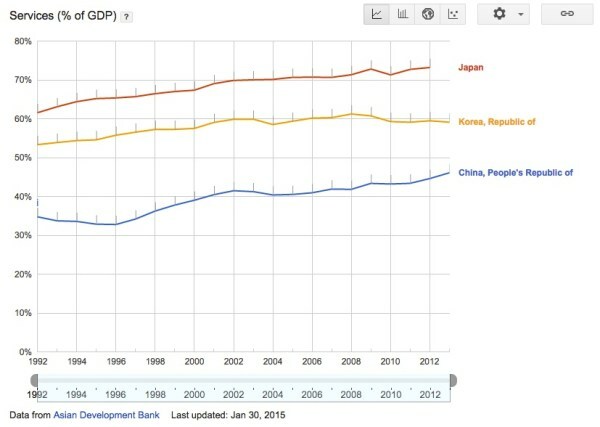 While the data from the Asian Development Bank did not include manufacturing data, industrial data includes manufacturing, but also agriculture, construction, and forestry–goods-producing sectors. Mitchell Blatt has been based in China and Korea since 2012. A writer and journalist, he is the lead author of Panda Guides Hong Kong guidebook and has contributed to outlets including The National Interest, National Review Online, Acculturated, and Vagabond Journey. Fluent in Chinese, he has lived and traveled in Asia for three years, blogging about his travels at ChinaTravelWriter.com. You can follow him on Twitter at @MitchBlatt.